Falcon 9. Photo Credit: SpaceX. 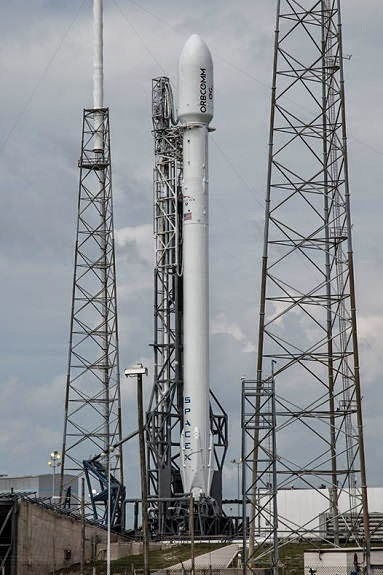 CAPE CANAVERAL, Florida -- After yesterday's scrub, SpaceX will have another chance again on Saturday, June 21, 2014, to launch its Falcon 9 rocket carrying six ORBCOMM Generation 2 satellites into orbit from Space Launch Complex 40 at the Cape Canaveral Air Force Station in Florida. The launch window opens at 5:46 p.m. and ends at 6:39 p.m. The most recent forecast issued by the U.S. Air Force 45th Weather Squadron predicts a 60% chance of overall permissible weather conditions for the SpaceX launch. The primary weather concerns for launch are anvil clouds, thick clouds, lightning and cumulus clouds. Where Can You Watch the SpaceX Rocket Launch? A. The Kennedy Space Center Visitor Complex offers the best possible viewing with paid admission. Visit the Kennedy Space Center Visitor Complex website for directions and more information. 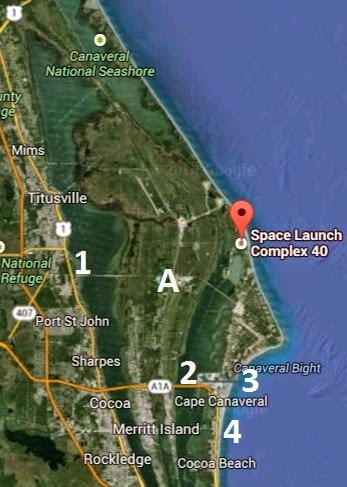 Map of Launch Complex 40 at Cape Canaveral, Florida. Credit: Google. Rocket launch viewing locations added by Brevard Times.